Transform your PC into a sound system to be reckoned with. Our collection of Logitech PC speakers presents a wide variety of speakers to suit every PC setup and budget. 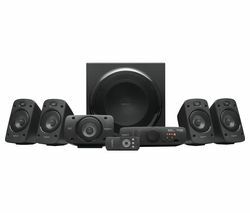 Audiophiles looking to bring games, movies and music to life with a serious stereo setup need look no further than the Z906 5.1 PC Speaker Set. Complete with five 500-watt THX certified speakers and subwoofer, this powerful surround sound setup delivers plenty of oomph plus truly immersive depth and clarity of sound. Alongside serious sound quality, ease of use is a big feature of our Logitech PC speakers. The MX Sound 2.0 Bluetooth speakers are perfect if you're looking for a compact, stylish and easy to set up wireless speaker solution. Thanks to Logitech's Easy-Switch technology it's easy to pair these clever little speakers with your desktop or smartphone - or any other bluetooth devices you want to connect them to. Then, once you've paired your MX speakers with your devices, seamlessly switching between them is beautifully simple - just lightly touch the motion-activated backlit controls. Another bluetooth option for those who want to embrace a wire-free lifestyle comes in the form of the Z337 2.1 Wireless PC Speakers, which deliver rich, powerful audio courtesy of two 40 W front-facing speakers and a 24 W subwoofer. Logitech also offers an indispensable product for those who are perfectly happy with the their existing speakers. The ingenious Bluetooth Audio Adapter allows you to pair your favourite speakers with bluetooth compatible devices, meaning you can wirelessly connect your smartphone, tablet or laptop to any speaker with a 3.5 mm or RCA connection.